Nathan Hicks is now Crestron P201 Core Systems Programming Certified. 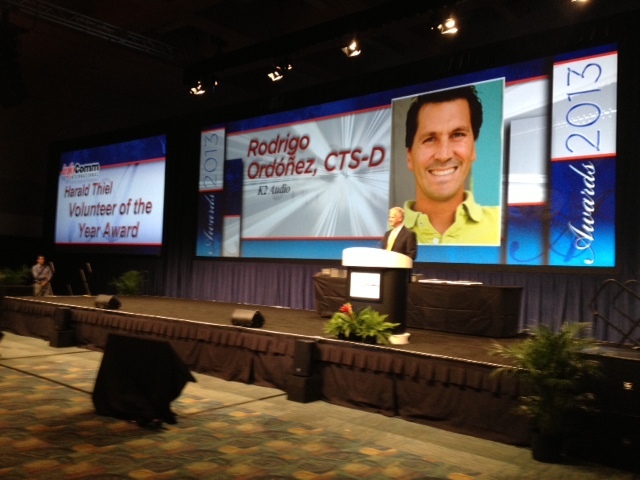 Rodrigo Ordonez was named InfoComm’s “Harald Thiel Volunteer of the Year” for 2013. This award reveals and celebrates the volunteer who has contributed greatly to the InfoComm association, and who is not recognized in other ways for that contribution. Ted Pyper just received his Professional Engineer license in the discipline of Architectural Engineering. K2 Audio just received its City and County of Denver Women Business Enterprise (M/WBE) certification! Nathan Hicks is now a certified AMX ACE-D (ACE Design Expert). Nathan Hicks is now a Crestron DigitalMedia Certified Designer. K2 Audio recently received Small Business Enterprise (SBE) certification from the City and County of Denver.